Skip the sunscreen, grab some goggles and see who can make the biggest cannonball splash. Feels good to get back at it after a long travel day. Cramped hotel room, this is most definitely not. Spread out in your spacious oceanfront condo. Located on the beautiful beaches of the Atlantic Ocean. Your kids will love the heated outdoor children's pool, arcade and children's club. You're just next door to the Nightmare Haunted House. Don't let the weather stop you from enjoying a swim – there's an indoor pool at the resort. 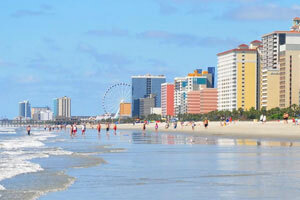 Beach Colony Resort is located right in the heart of Myrtle Beach facing the beach. After dropping off your luggage in your condo, get changed into swimsuits, grab pool toys and water wings, spray on sunscreen and get ready to be amazed at all of your pool options. There are three pools, two outdoor and one indoor (in case the weather isn't cooperating). Little ones will love the outdoor children's pool – it’s just their size! Get a break from the heat with a relaxing float down the outdoor lazy river. Order lunch from the poolside bar & grill; you won’t even need to dry off! Surprise the kids with a stop at Shark Bites, the ice cream & snack bar before heading to the children's club. The beach is so close; it’s no big deal if you forget the sand pail or swim shirts and have to run back to the condo. The activity calendar is worth a look – take a vote or exercise your executive power and make the decisions for your crew. Or see if anyone’s up for a fast-paced game of racquetball, or a not-so-fast-paced round of shuffleboard. All condos at Beach Colony Resort are individually furnished and decorated. One-bedroom condos sleep six guests and include kitchenettes that have a mini fridge and a two-burner stovetop allowing you to prepare the basics. Upgrade to an Executive One-Bedroom condo for a full kitchen. Stock up on groceries at Food Lion. Recruit the kids to help bake your famous double chocolate brownies (not that they’ll need convincing). Did the kids end up with chocolate on their clothes? No problem! There’s a laundry facility on-site. Two-Bedroom condos sleep up to eight guests, include a full kitchen and – bonus! – an in-suite washer/dryer. Flatscreen TVs with Cable and DVD players are perfect for family movie night. Bring favorite movies from home or browse the selection of free DVD rentals available at the front desk. Pop some popcorn, call everyone into the living room and ask for a show of hands to decide what to watch first. If you’re traveling with golfers, you likely already have a local course plan mapped out – start early in the week to get them all in. Live entertainment is a Myrtle Beach must as well. Check out the shows online for dates and ticketing. Go for a ride in the climate-controlled gondolas on the SkyWheel. It’s almost two-hundred feet tall and provides the best views of Myrtle Beach. Take a family field trip the Children’s Museum of South Carolina. Kids will love exploring the interactive exhibits; they will have so much fun that they won’t even realize they’re learning! They will learn about money at The Big Bank, dinosaurs at the South Carolina Fossil House and the scientific method at Water Works. Visit the 750,000-gallon shark tank at Ripley’s Aquarium. Go on a glass-bottomed boat ride or swim with stingrays. - Due to parking restrictions, motorcycles and trailers are not allowed on site.